I actually needed a waterfall cardigan, and indeed, had bought the fabric back from Thailand with me. I bought it on the Indian market in Bangkok. I knew that McCalls 7294 was due to be free to download from Love Sewing, and had the pattern pieces cut out and ready before the magazine arrived. It took almost as long to line up the PDF and trace the pieces as it did to make the cardigan. I did wait for the instructions in the magazine though. I had noticed that the downloaded pattern had two potential lower edges and wanted to see what that was all about – we’ve only got part of the pattern offering and presumably the other edges are part of a different option. With the exception of stay stitching the neck edge, it was all done on the overlocker, even the pivoting at the stay stitched dot, as the fabric can be stretched to a straight line at that point. Rather than folding the edges over and stitching all around, I just overlocked all round, and that makes it hang better. That does mean that I needed a good match of overlocking thread, but my minimal stock of 3 colours provided a good match! I am needing to buy more overlocking thread for a good match for the next one though – and hopefully the new stock will arrive at least 1.5 hours before Mother’s Day. Conclusion – I am pleased. I will be doing it again, later this week! ….which I think looks equally as good, although Mum’s reaction was less enthusiastic, in as much as its not the sort of thing she would normally wear. 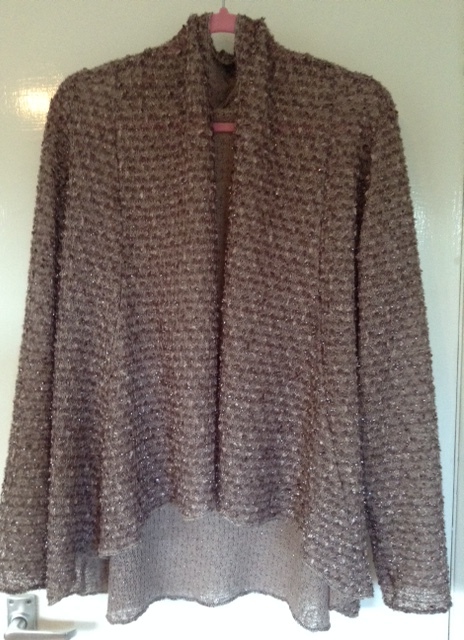 This entry was posted on February 28, 2016 by ann hebden in Cardigan, Fashion, Handmade, Love Sewing, McCalls, Sewing and tagged Cardigan, Fashion, Handmade, knits, McCalls, Overlocker, Sewing.